These simple pizzas come together in just 30 minutes for a fast midweek meal. 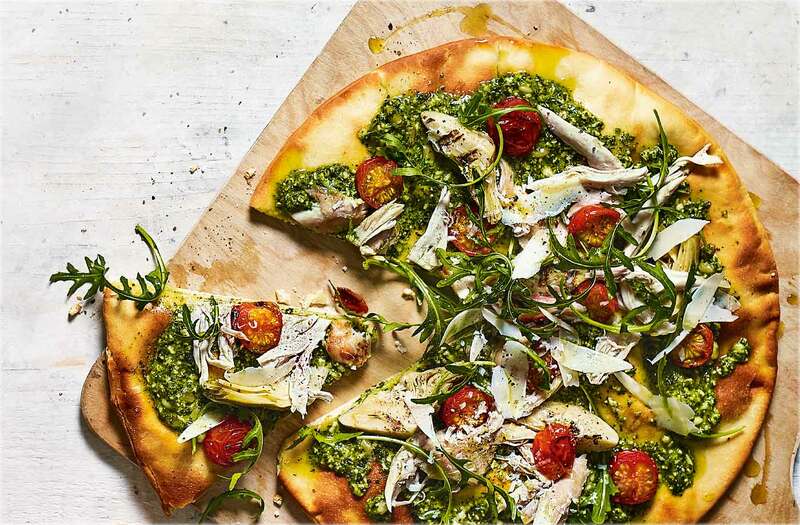 Swapping a traditional tomato sauce for a pesto base puts a new spin on a classic pizza, and you can use up leftover cooked chicken from a roast for the topping. fan 200°C. Remove the meat from the drumsticks, discarding the skin and bones. Unroll the pizza bases on 2 baking trays. Spread the pesto over the bases, then arrange the chicken, artichokes and cherry tomatoes on top. Bake for 20-25 mins until the edges of the dough are golden. Scatter over the rocket and Parmesan, if using, and cut into slices to serve.